Investors have an obscure way to place bets that the market will stay calm. And for more than a year, they couldn't lose. Stocks crept higher and higher with barely a bump. But those bets suddenly went bad this week when the market took a terrifying plunge. And those little-known investments may have made it worse. Several risky funds that reward investors when the markets are quiet imploded in the global market rout. Those funds are inversely linked to the VIX, a gauge of turbulence in the market. So when volatility spiked by a record 116% on Monday, the funds plummeted. "That was a very crowded trade, full of people who didn't understand the products," said Sal Arnuk, co-founder of Themis Trading and co-author of the book "Broken Markets." "And it blew up in their faces." The most popular inverse volatility fund is the VelocityShares Daily Inverse VIX Short-term ETN (XIV), also known as the XIV. It lost almost 100% of its value after the market closed on Monday. It had spiked 188% last year, during a period of unusual calm for the stock market. Credit Suisse, which runs the fund, announced it would close it later this month, 12 years ahead of schedule. Credit Suisse said there would be "no material impact" to the bank. A similar fund run by Nomura Securities is being liquidated after it crashed. And the ProShares Short VIX Short-Term Futures ETF (SVXY) plunged 85%. Some market analysts believe the implosion of these complex instruments, which are favored by hedge funds, may have driven the VIX higher and stocks lower than they otherwise would have been. The Dow plunged by a record 1,175 points on Monday. "There is a feedback loop. It all snowballed," said Michael Block, chief market strategist at Rhino Trading Partners. He said it "absolutely" contributed to the market turmoil. The theory is that investors who suffered massive losses betting against volatility were forced to "panic sell" into the broader market, driving stocks down further. It became a vicious cycle. "It spirals," Block said. "Suddenly everyone is selling, and rather than give up your whole year of gains, you start puking as well." To be sure, the market wasn't down just because of these complex volatility instruments. Fear returned to the market because of worries about inflation and spiking bond yields. But those concerns may not fully explain the severity of the losses. "While it's not the underlying cause," RBC Wealth Management portfolio analyst Kelly Bogdanova said, the volatility funds "certainly fueled the move and made it a bigger move." The inverse volatility funds are not meant for casual investors. They are geared toward sophisticated speculators, hedge fund investors and other traders with deep understanding of hedging. Whenever markets go haywire, some people blame the sophisticated computer programs that buy and sell stocks based on complex algorithms and formulas. And while high-frequency trading does often exacerbate volatile markets, Themis Trading's Arnuk said this week's turmoil didn't begin there. Kristina Hooper, chief global market strategist at Invesco, said there were "a lot of forces at work," but the short volatility trade blowing up "certainly aggravated it." BlackRock, which has made a fortune on the boom in exchange-traded funds, put out a statement Monday saying it "strongly supports a regulatory classification system" that would differentiate "plain-vanilla ETFs" from the risky funds that imploded. The good news is that unlike the risky mortgage securities at the heart of the 2008 crisis, these volatility instruments don't change the overall economic environment. "It's not systemic. This is not like the housing market or credit markets blowing up," said Block. "Maybe we have already seen the end of it." 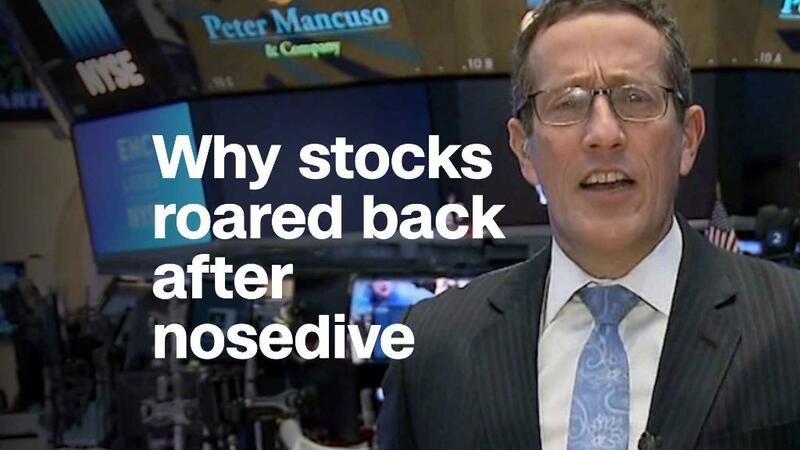 --CNNMoney's Julia Horowitz contributed to this report.